Go birdwatching with a Birdingpal from New York. I live in upstate New York between Lake Ontario and Adirondack Mountains. I have been birding since the 1960's. My maiden name is Kelley - my great grandfather came from Roscommon. Lots of habitat variety around Albany. Mountains, fields, marshes, rivers, deciduous and conifer forests. Adirondack National Forest and Catskill mountains both a couple hours away. The Binghamton area has several very good spots to bird. One is listed on the NY important areas. Warbler migration time is most likely our best time. It is not unusual to get 20 types of warblers on a good morning. I am a member of our local bird club, where I am on the broad and lead a weekly trip to local hotspots. I have done the World Series of Birding for the last 7 years, being the captain the last 3 years. Once a year I lead a national trip to Alabama. A relatively new birder, with a pretty flexible schedule looking for fellow birders to hit the local hot spots with (esp Prospect Park). I live in upstate New York between the Hudson River and the Vermont border, between Albany, NY and Bennington,VT. I am a profitient birder. I have traveled extensivly throughout the U.S. birding. I also have a lot of research experience working with many of the local passerines and have done bird research elsewhere in the country. Novice birder, area of Eastern Great Lakes, featuring migratory routes and water fowl. I am an intermediate birder, based in Fredonia, Chautauqua County. Dunkirk Harbor is a great sight to spot overwintering water fowl. I also know of several local "hot spots". A short 45 minute will take you to the Roger Tory Peterson Institute, as well as the local Audubon Society. I am free most weekends, and with enough daylight available, most evenings. I am a senior at Hamilton College in Clinton, NY. I am a passionate but intermediate birder of the birds normally found around the central NY state area. If you are interested in doing some birding in the Utica/Rome area let me know! If I am not around I have most likely gone home to the seacoast of New Hampshire for break. I am within an hour's drive to Basha Kill Wildlife Refuge which is great for migrating warblers. Also near Wallkill River Refuge and Kenridge Farm for Orioles, warblers, etc.Also am near Iona Island for Cerulean warblers. I love birding, especially as a social activity with other people. I have been actively birding for about 10 years and have traveled to bird in places like Iceland and Panama, among others. Migrating Warbler Species, Shore Birds, Owls, Etc. This area, Sullivan County, is in the foothills of the Catskill mountains and contains the Bashakill Wildlife Area, the Delaware River, lakes, and farmland. I am not an expert birder, but can recognize most of the local species by sight and sound. Hyde Park is on the Hudson River about 100 miles north of NYC. It is a rich birding area. I mostly bird with a camera and kayak. Two excellent natural areas are the Audubon Ramshorn Sanctuary near Catskill, NY and the Tivoli Bays area near Tivoli (Rhinebeck, NY). Both are best accessed by Kayak - both are fresh water tidal areas. I am NOT going to be in the area this late spring, summer and fall as I will be traveling throughout the Western and North Central US birding and picture taking for the season. I will be in semi-regular (at least weekly e-mail) contact with the world. I would be glad to give long distance advice on my area while I am away. I am willing to go birding with visitors for a morning, or perhaps a full day in the vicinity of Hudson, New York without pay. I am a teacher, so I can go out on week days in the summer. I am an experienced birder and have been birding since 1976. I am interested in all aspects of natural history, especially entomology. I Band (ring) birds for the U.S. Fish & Wildlife during May, September & October, as a hobby. I live on Long Island, NY. where I am near ocean, bay and wooded habitat. Retired but still working. Can go birding on different days. Have been a casual to serious birder for over 50 years. Long Island, New York, is located along the Atlantic Flyway in Eastern North America. The widest variety of birds are present during spring and fall migration, with peak diversity in May and again from August through early October. As a coastal barrier island, winter is also good for interesting waterfowl, gulls and vagrants from western North America, while shorebirds (waders) are often the higlight during midsummer. Local specialties include, at the proper seasons, Piping Plover, Roseate Tern, Fish Crow, Sharp-tailed Sparrows, Seaside Sparrow and alcids and sea ducks. I've been birding Long Island for over 30 years, and I've been leading field trips for local birding groups for most of that time. I'm very familiar with Long Island hotspots, somewhat familiar with Manhattan and New Jersey areas, but I can offer general guidelines for most areas in the northeastern US. Major spring migration area, near lake Ontario, various habitats, all make upstate NY a great place to bird! 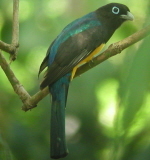 Work at Bronx Zoo, travel to S American and C America looking for local birders and people who would like to get together and travel to Mexico in a group. Have traveled to Peru, Guatemala, Costa Rica and Texas for birdwatching. Live in Bronx next to Botanical Gardens. Have a house in Bonoa, Dominican Republic. I'm a Native New Yorker and live in New York City and have been birding for the last few years. I love to travel, and try to bird a bit whenever I travel if it's possible. I also enjoy photography and try to incorporate that into my birding trips as well. I bird as much as I can in New York and bird quite frequently in Central Park. I enjoy birding across the greater New York City area. I'm an academic working on Latin America. I have been birding for 25 yrs or so. I do not have a car but I can take birders out to places accessible by public transportation, such as Central Park, Prospect Park, and Jamaica Bay Wildlife Refuge. Long-time birdwatcher (with car) familiar with NYC and metropolitan area, including Long Island, lower Hudson River Valley, and central/northern New Jersey. All seasons daily sunset tour of Hudson River Park, west village generally Christopher Street to w 14 street along river side some horticultural/garden interests as well Audubon and Sierra Club, information per other areas. I am a 16 year old high school student who resides in Manhattan, New York City, and has a second home"+" in Sheffield, Massachusetts. I have been been birding over 9 years, and my passion from Ornithology has taken me all over the U.S., as well as to South America and Europe. I am very familiar with Central and Riverside Parks in Manhattan, as well as the birding locations in Southern Berkshire County, Massachusetts. As I am a student, my time may be limited, but I will try my best to show any guest the local wildlife. I understand some of the best bird-watching occurs in Central Park. I would like to learn more about birdwatching here and wherever I travel. We have Central Park, Riverside Park and miles of shore. I am a Brit living in Manhattan. I have been in the US for 3 years as at 2012. I have reasonable knowledge of sites in and around Manhattan. I have previously lived and birdied in the UAE (3 years). Prior to that birding very UK centric. Great parks especially in spring. I am very familiar with Iroquois National Wildlife Refuge, and the Lake Plains. Contact me with your bird wish list and I'll let you know which birds we may see. I also have access to up-to-date Rare Bird reports. Western New York has many different ecological areas to explore from the hills of Allegany State park to the marshes of Iroquois National Wildlife refuge. In winter the Niagara river and Lake Ontario sustain many wintering waterfowl. I'm available most weekday mornings and weekends. I love the Rochester area and its birding spots, and enjoy showing them to new people! Live in foothills of Adirondack mountains on 150 acres. Be glad to show our area to anyone traveling in the area. I live in the hamlet of a small town and supply many feeding opportunities through feeders, flowers, shrubs etc... I have been birding for only 5 or 6 years and began with hummingbirds. From there my love grew to all the birds in the area. My wife and I live near Albany, the capital city of NY state (3 hours north of New York City by car or train). There are many good local birding spots we enjoy including Five Rivers Environmental Center, Vischer's Ferry and Niles Huyck Nature Preserve. Veterinarian/Birder/Photographer Mid-Hudson Valley New York. I'm a Naturalist/Wildlife Biologist who's been birding for more than 30 years. My knowledge not only includes birds but anything on wildlife and plants. I have lived in the tri-state area all my life so I'm familiar with all the good birding spots such as Central Park, Jamaica Bay, Brigantine NWR, Cape May, the Adirondacks, etc. I can take someone to any of the sites in the NY, NJ, CT area. I am located just one half hour north of NYC and would be happy to meet anyone at their hotel. It is best to contact me to see when is the best time to go to a certain site or have any specialties you want to see. I charge $40/hr (2 hour min. plus gas, tolls and lodging if required). I am a professional ornithologist with an undergraduate degree from Cornell University, where I worked at the Cornell Lab of Ornithology. I have been a serious birder for over a decade, with international birding and fieldwork experience in Central America, South America and Europe, and I've also participated multiple times in the World Series of Birding. I'm available to guide in the New York City area and throughout New Jersey, with extensive knowledge of Central Park, Cape May, and the breeding birds of Northern New Jersey in particular. I can provide transportation with my own car as well. I pride myself on being able to cater to serious listers, casual/beginning birders, and everything in between. I generally charge $30/hour, or $200 for a full day, but this can be vary based on the need for car transport and other factors. Friendly knowledgeable birding guide in the New Jersey, New York metro area Some of the best bird migration sites in the Eastern USA are in the NY, NJ, Metro area. The migration through NJ during April and May has becoming better known in the last few years after many teams from around the world have competed in the World Series Of birding. There are also within 1hr from Manhattan Island some breeding sites of the less common and highly sought after species Including Golden-winged, Worm-eating and Blackburnian warblers. Add to that the Sandpiper migration in July through August and you have a World class birding area for most of the year. 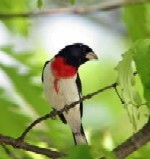 I have 20 years experience as a bird guide in NY, NJ, PA and GA leading bird walks for bird clubs and organizations. I have a masters U,S,G,S, banding permit and earned a B,T,O, "A" ringing permit before emigrating to the USA. The best birding is just after sunrise and so most days 4 or more hrs birding can be managed before any other commitments. There is always a minimum of a four hr charge. There is a lot of information including MAPS & descriptions of most birding hotspots.